The telecommunication services market, which includes fixed-network services and mobile services, had a value of around 1.4 trillion U.S. dollars in 2017, and is forecast to grow to almost 1.46 trillion U.S. dollars in size by 2020. The biggest markets for telecom services are the Asia/Pacific region, Europe and North America. Mobile and wireless technologies have become more prevalent in the past 15 years. The market is expected to continue to gain space in the telecommunication services industry, as the number of mobile connections worldwide is predicted to reach nine billion by 2020, about twice the amount of 2009. Wireless data is also a key market for telecommunication companies. The total spending on wireless data telecommunication worldwide is forecasted to reach nearly 500 billion U.S. dollars by 2019. The wireline – also known as fixed-line – services market includes the traditional fixed telephone landline and fixed broadband, a non-mobile high-speed internet connection. 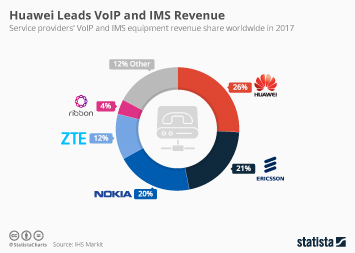 Despite the declining fixed voice services market, fixed telecom spending is forecast to grow moderately in the next few years due to the rising demand in broadband access. While the number of fixed telephone subscriptions has decreased since 2006, the number of fixed broadband subscriptions has increased over the years. The telecommunication services industry is dominated by multinational telecommunications companies that generate billions of U.S dollars in revenues each year. Two American companies, the Dallas-based AT&T and New York-based Verizon, are global industry leaders, with brand values of nearly 90 billion U.S. dollars each. China Mobile, Vodafone, Deutsche Telekom are also amongst the leading telecom brands worldwide. Next to revenues and brand values, the churn rate – average percentage of subscribers that cease to use the company’s services per month – and the average revenue per user (ARPU) are also used to measure the performance of telecom companies. In the U.S., for example, both Verizon and AT&T have the lowest average churn rates for wireless carriers in the market.